Irish Rare Birds Committee review of presumed vagrant Canada Goose Branta canadensis records to ascertain the occurrence of Cackling Goose Branta hutchinsii. Picture 1. Artist's impression of the Canada / Cackling Goose complex following Banks et al. 2004 (© Michael O'Keeffe). This review article is dedicated to the memory of Oscar J. Merne who passed away in January 2013. In 1969, Oscar became the first ever warden at the newly established Wexford Wildfowl Reserve. During his time there, he documented, and attempted to photograph and allocate to subspecies any Canada Goose that occurred amongst the wintering geese. This documentation greatly assisted the IRBC in their assessments of these geese over the years. In Ireland, Canada Goose Branta canadensis has an introduced population as a result of being kept in wildfowl collections since the early 1800s, and it is assumed that some ten separate records listed in the 19th century were individuals that had escaped from these captive populations (Ussher & Warren 1900). In 1969, their feral populations were estimated at 229 birds (Merne 1970). A repeat survey in 1994 found their populations had increased to an estimated 538 birds (Browne et al. 1998) and the most recent figures estimate a population of 1,163 birds in 2010/11 (Crowe et al. 2012, Holt et al. 2012). Their distribution has remained localised and similar throughout these surveys, primarily being found in Counties Fermanagh, Down, Cavan, Leitrim, Donegal and Cork. As a result of this established feral population, Canada Goose is on the Irish list as a Category C1 species; that being 'species that, although originally introduced by man, have established feral breeding populations in Ireland which apparently maintain themselves without necessary recourse to further introduction'. In addition, it is also on the Irish list as a Category A species; that being 'species that have been recorded in an apparently natural state in Ireland at least once since 1st January 1950'. These have involved birds belonging to one of the smaller subspecies and/or occurring in winter (generally at sites not normally frequented by feral birds) and/or associating with flocks of suitable carrier species (e.g. Greenland White-fronted Goose Anser albifrons flavirostris and Barnacle Goose Branta leucopsis). Up to the early 1980s Wexford Slobs (Wexford) were the main focal point for vagrant Canada Geese with birds being recorded there almost annually, especially during the 1970s. Many of these were believed to involve a number of returning individuals. Often their movements coincided with the arrival in October and departure in April of Greenland White-fronted Geese, and therefore supported the possibility of wild origin. Since the mid-1980s records from Wexford have been less frequent and, although they continue to be recorded there, it is only on a sporadic basis. In contrast, the north-west of the country (presumably linked with an increase in observer numbers there) has become the stronghold for records of 'small Canada Geese' with birds being found among flocks of Barnacle Geese at their regular wintering haunts such as Dunfanaghy (Donegal), Lissadell (Sligo) and Termoncarragh Lough (Mayo). Picture 2. Cackling Goose (right) paired with Barnacle Goose together with four hybrid offspring and two more Barnacle Geese, North Slob, Wexford, 1970, representing the first Irish record of this species (Photo: Thomas Ennis). This pair may have been present in 1969 with two hybrid young and may also have been present during the winter of 1974-75, again with a hybrid bird. However, there is insufficient detail available to confirm the identification of the bird(s) present during those two other winters. The taxonomy of the Canada Goose complex is, at best, complicated and certainly far from settled. Until 2004 there were generally 11 extant subspecies of 'white-cheeked' geese recognised under one species, Canada Goose (Delacour 1954), and although some effort was being made to identify individual geese to sub-specific level this has never been considered straightforward. Hence, various Canada Goose records in Ireland being published within the Irish Rare Bird Reports as 'presumed to be of North American origin'. Then, in 2004, following phylogeographical analyses and morphometric study of the complex, the American Ornithologists' Union (AOU) separated the 'large' and 'small' forms into two separate species; Canada Goose (Branta canadensis) and Cackling Goose (Branta hutchinsii) and proposed the following (Banks et al. 2004; Picture 1). This treatment was adopted by the British Ornithologists' Union (BOU) in 2005 (Sangster et al. 2005) and followed by the IRBC in 2009. As such, these changes had relevance to the Irish List, and the first published record for Ireland of a Cackling Goose was of a bird showing characteristics of the subspecies hutchinsii at Kinnegar (Down) on 13th September 2007 (Milne & McAdams 2009); Cackling Goose was added to the Irish list under Category A. Following this treatment, and prior to the publication of the bird in County Down, the IRBC commented (Irish Birds 7: 387) that it would continue to monitor progress made both in North America and in Europe in resolving this complex identification challenge before embarking on a detailed review of records from the Republic of Ireland. In 2006, the complex was 'muddied' further when Hanson (2006) published the first of two volumes on the 'white-cheeked' goose, in which he recognised six species and 217 subspecies! 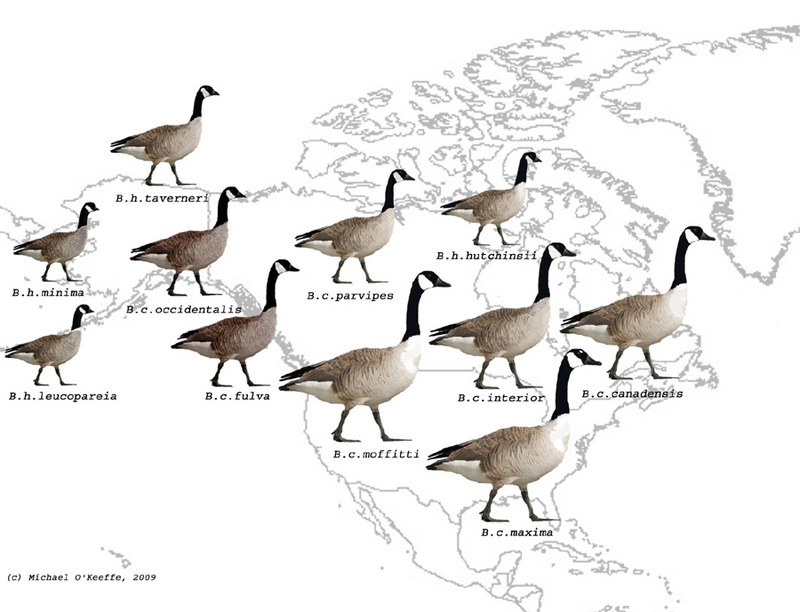 Further work by Anderson (2010) proposed 15 species and 181 subspecies, of which nine species and 98 subspecies correspond to 'Greater Canada' and six species and 83 subspecies to 'Lesser Canada/Cackling Goose'. It is clear that to identify some populations or individuals in their home range, let alone single birds in the wrong continent, is not a straightforward task. However, the publication of an authoritative paper by Mlodinow et al. (2008) helped shed some much-needed light on the complex identification of Cackling Goose, concentrating on the subspecies B.h.hutchinsii, taverneri, minima and leucopareia as well as (because of its close resemblance) the Canada Goose subspecies B.c.parvipes (although it is interesting to note that neither Hanson (2006, 2007) nor Anderson (2010) recognise parvipes as a subspecies). It was in this context that the IRBC began its review in 2010. With the potential for further taxonomic changes in the future (as illustrated in the works of Anderson (2010) and Hanson (2006, 2007)), the IRBC adopted the decision to review these records based on criteria offered by Mlodinow et al. 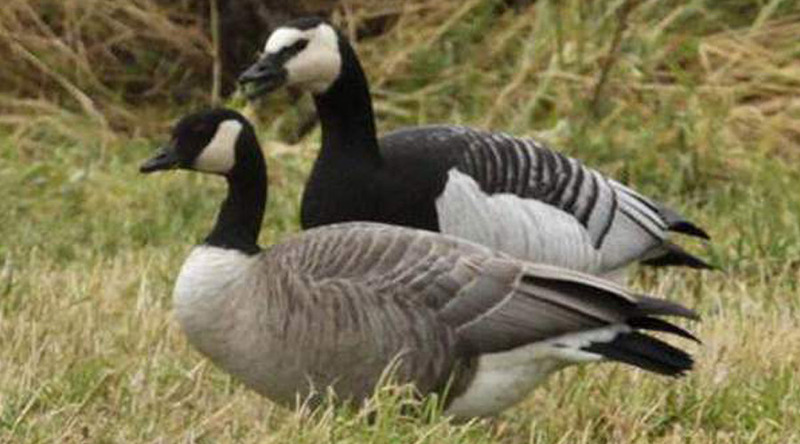 (2008) for Cackling Goose and to attempt to assign individual birds to sub-specific level, particularly to hutchinsii, while taking a more conservative line with the other subspecies. For consistency, all other records post 2009 occurring within the Republic of Ireland have been assessed by the IRBC using the same criteria. Picture 3. Pictured front left, what appears to be the first confirmed Cackling Goose of the subspecies minima for Ireland. This bird was photographed at Lurgangreen, Louth on 18th February 1996 (Photo: Don Hodgers). Its diminutive size, greyish back and very dark, purplish-brown breast and belly strongly support that conclusion. Given the geographical range of this subspecies along the west coast of North America, its popularity in captivity in Europe and perhaps given the eastern location of the record in County Louth the IRBC takes the view that this bird is most likely of feral or captive origin. Other possible examples of minima on record include a sequence of records from Lambay Island, Co. Dublin during the 1980's and a bird at Lissagriffin, Co. Cork in 1985. Picture 4. Canada Goose, shot, North Slob, Wexford, 18th January 1971 (Photo: Oscar J. Merne). This bird was one of at least four present during that winter, together with the Cackling Goose featured in Picture 2. On examination, this bird was said to have been confirmed as a canadensis however with no other details available for assessment this individual has not been assigned to subspecies. The review found 19 acceptable individuals of Cackling Goose between 1970 and 2009 (Appendix 1 ). The first was of one paired with a Barnacle Goose and with four hybrid offspring seen at the North Slob (Wexford) from 6th October 1970 to 28th April 1971 (Picture 2). This bird was unassigned to subspecies (but excluded minima). The first record assigned to subspecific level was one at Raghley Point (Sligo) from 24th February to 7th March 2003 which was accepted as hutchinsii. Up to the end of 2011, a further 12 individuals were accepted as hutchinsii. Appendix 3 lists a further ten individuals where the details available to the IRBC were not sufficient to exclude the possibility of the birds being minima and it is felt that records of definitive or likely minima may refer to birds of feral or captive origin. Its potential for true vagrancy to Europe is open to speculation given its west coast distribution in North America (breeding in western Alaska and wintering on the Pacific coast) and therefore these are not included in the final statistical figures. There is just a single record of what appears to be a definitive minima, a bird photographed at Lurgangreen in Co. Louth in January 1996 (Picture 3). For Canada Goose, a total of 29 individuals were considered acceptable as 'presumed to be of North American origin' between 1969 and 2009 (Appendix 1). While many of these appear to refer to B.c.interior the IRBC have, in many cases taken the decision to categorise such records as unassigned to subspecies. However, five were accepted as interior, including a record of a bird trapped and ringed on 1st November 1993 at North Slob (Wexford). This individual was subsequently shot on 14th January 1995 in Dorchester, Maryland, USA. Between 2009 and 2011, a further two have been accepted as 'presumed to be of North American origin'. A further 23 individuals between 1969 and 2009 were not possible to assign to either species on the documentation available although they were considered acceptable as 'presumed to be of North American origin'. Many of these birds were originally claimed as B.c.parvipes, the smallest subspecies of Canada Goose. The full list of all records reviewed is given in the three Appendices. For completeness, published records in Irish Bird Reports and Irish Birds from Northern Ireland (three individuals) and those records between 1954 and 1969 from the Republic of Ireland (34 individuals) are also included in the Appendices as 'presumed to be of North American origin' but unassigned to species. Picture 5. Cackling Goose (left) and Canada Goose (right), Lissadell, Sligo. Remained from 25th October 2009 to 8th April 2010 (Photo: Paul Kelly). One of the more celebrated sightings in recent years and a perfect opportunity to study hutchinsii alongside a small Canada Goose, which was considered by many to be a parvipes. The IRBC, however, has taken the decision to err on the side of caution for now when assigning birds to this subspecies. Picture 6. The review considered five putative Cackling Geese of the subspecies taverneri including two birds from Wexford in the 1970s for which no photographic record exists and three more recent birds which were all well photographed. The most recent of these was present at Ballyconnell, Sligo from 3rd November 2010 to 27th March 2011 (Photo: Micheál Casey). These birds have been characterised as being slightly larger in length than accompanying Barnacle Goose with a longer, narrower neck, a more rounded head profile, a dark gular stripe and a slightly dark breast. None of these features are diagnostic however. North American expert opinion is divided on the identity of these and many other out-of-range taverneri. There are also taxonomic questions over taverneri itself due, in part, to a lack of knowledge and status of Cackling Geese in the high Arctic where the ranges of taverneri and hutchinsii should meet. More importantly, given the far west coast range of taverneri it seems a far less likely candidate for vagrancy to Europe than hutchinsii. Given all these questions that remain the IRBC will for the foreseeable future classify such birds as Cackling Geese, subspecies unassigned. Generally, the task of separating Cackling from Canada Goose in Ireland is not too difficult. Size remains the most important criterion. When faced with a large 'white-cheeked' goose, it is either a feral bird or a potential vagrant Canada Goose, perhaps of the subspecies interior or canadensis. Where a bird can be accurately gauged to be the same size as, or smaller than, a Barnacle Goose then in all likelihood it will prove to be a Cackling Goose. Luckily, most Cackling Geese in Ireland tend to be found in the company of Barnacle Geese, making this task a lot easier. However, a 'mid-sized' goose, judged to be between Barnacle and Greenland White-fronted, could be either a small female Canada Goose of the subspecies interior, or subspecies parvipes or perhaps a Cackling Goose of the subspecies taverneri. Together, subspecies B.c.parvipes and B.h.taverneri form a complex that is frequently, and confusingly, referred to as 'Lesser' Canada Goose; this grouping represents one of the greatest taxonomic and identification challenges yet to be thoroughly resolved. The taverneri subspecies of Cackling Goose, sometimes referred to as Taverner's Goose, is a particular enigma. Within North America, their range relative to hutchinsii has yet to be fully established. Among the various subspecies of Cackling Goose, an out-of-range taverneri often appears to be among the most contentious. Moreover, among North American experts consulted during this review, there was no consensus reached on any recent taverneri claims in Ireland other than that they were all considered to be Cackling Geese. Consequently, the IRBC has taken the decision to defer subspecific analysis for all putative taverneri records for the foreseeable future. 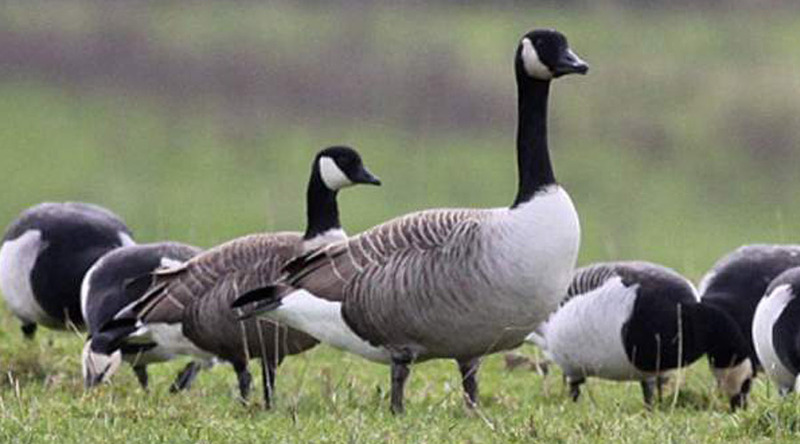 However, these birds are acceptable as Cackling Geese (subspecies unassigned but excluding minima). It is hoped, given the high quality of documentation that exists for some of these records, that the sub-specific status of these birds may be revisited in due course. In the case of sub-specific categorisation of Cackling Goose, an analysis of the reports show they appear to consist almost exclusively of the easternmost, nominate subspecies, hutchinsii. This form breeds throughout Arctic Canada and winters in the south-eastern and mid-western United States. It is the form probably most likely to encounter carrier species heading for north-western Europe and, conveniently, many hutchinsii seem to be readily identifiable by a number of reliable criteria. During the review process, however, it was noted that some birds displayed darker breasts than would be expected for a 'typical' hutchinsii, whilst all other features conformed to the criteria given for that subspecies. After deliberation, these birds were categorised as hutchinsii despite the knowledge that this may prove untenable at some point in the future. Of the seven subspecies of Canada Goose listed (Banks et al. 2004), two (canadensis and interior) are considered potential vagrants to Ireland, while one (parvipes) is a possibility. B.c.canadensis most closely resembles the feral population and therefore it may not be possible to confidently identify a 'wild' canadensis in Ireland unless it either carries a North American ring or is trapped and confirmed through measurements and isotope analysis. None have been found to date, although a bird shot in Wexford in 1971 was referred to as a canadensis at the time (Picture 4) and may well be the first wild candidate, but there was insufficient detail on file to reach a conclusion during this review. There is just one confirmed wild Canada Goose record; an individual interior ringed in Wexford in 1993 and later shot in Maryland, U.S.A. (Irish Birds 5: 362, 452). While some of the other accepted large Canada Goose records may have referred to the subspecies interior, the IRBC took the decision in many cases to categorise such records as unassigned to sub-specific level. Similarly, in the case of a number of claims of the smallest subspecies parvipes, it was felt there was insufficient evidence to accept any claims of this form to sub-specific level at present. For example, a well studied and photographed bird in Sligo during winter 2009-2010 (Picture 5) kept company with a Cackling Goose (subspecies hutchinsii) and was felt, by many observers, to be a good candidate for parvipes. However, Fox et al. (2012) found that all specimens of claimed parvipes in Greenland were, in fact, interior type, hence confirming that parvipes has yet to occur there. With this in mind, and that our carrier species come from Greenland, the IRBC has chosen to leave these claims of parvipes unassigned for now. This review has helped to shed some light on the status of vagrant Canada and Cackling Geese in Ireland but it is by no means the last word on the subject. The IRBC fully expects to be revising this complex area again. We therefore request that all claims of Cackling Goose and any potential 'wild' Canada Goose be supported by detailed notes, including where possible photographs and, ideally video footage. Picture 7. In November 2011 no less than three hutchinsii were present at Lissadell and Ballyconnell, Sligo which is becoming one of the best sites in the country to encounter Cackling Goose (Photo: Micheál Casey). With their characteristic small size (generally smaller than Barnacle Goose), short neck, short bill and square head they are usually relatively straightforward to identify. Some individuals have darker breasts and may represent a different form but with other features seemingly consistent with hutchinsii, for now these are being classified as such. Picture 8. This intriguing bird was present at The Lough, Cork. Remaining from 26th December 1999 to 8th March 2000 (Photo: Harry Hussey). Time of year might support wild origin but its presence among Cork's well-known feral flock of Canada Geese, its tameness and its damaged wing all cast doubt on its origin. Despite its diminutive size it appears to be a Canada rather than a Cackling Goose and it may in fact be a 'runt' feral bird from the local population - another potential pitfall for the unwary! The IRBC would like to thank those who responded to a request for supplementary information for this review. We would also like to thank those that assisted with comments on some of the individual deliberations, in particular, Chris Batty, Steve Mlodinow, David Sibley and Alvaro Jaramillo. Mike O'Keeffe instigated this review during his time on the IRBC, gathered together much of the documentation and produced a first draft. Anderson, B.W. 2010. Evolution and taxonomy of White-cheeked Geese. AVVAR Books, California. Banks, R.C., Cicero, C., Dunn, J.L., Kratter, A.W., Rasmussen, P.C., Remsen, J.V., Rising, J.D. & Stotz, F.C. 2004. Forty-fifth supplement to the American Ornithologists' Union Check-list of North American Birds. The Auk 121: 985-995. Browne, A.M., O'Halloran, J. & Smiddy, P. 1998. Introduced Canada Branta canadensis and Greylag Goose Anser anser populations in Ireland, 1994. Irish Birds 6: 233-236. Crowe, O., Boland, H. & Walsh, A. 2012. Irish Wetland Bird Survey: results of waterbird monitoring in Ireland in 2010/11. Irish Birds 9: 397-410. Delacour, J. 1954. The Wildfowl of the World. London. Fox, A.D., Sinnett, D., Baroch, J., Stroud, D.A., Kampp, K., Egevang, C. & Boertmann, D. 2012. 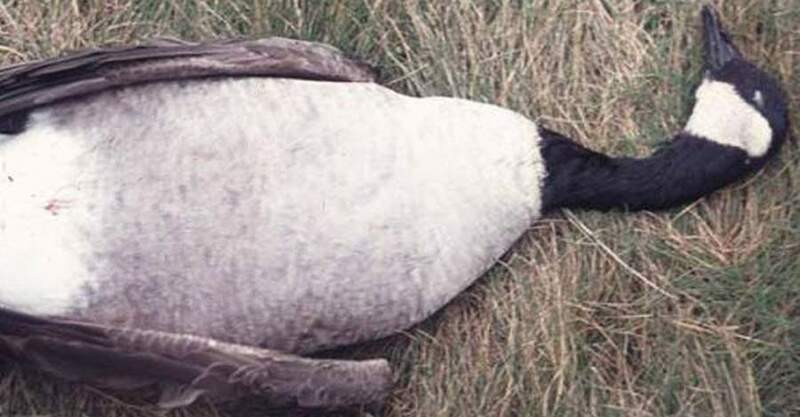 The status of Canada Goose Branta canadensis subspecies in Greenland. Dansk Ornithologisk Forenings Tidsskrift 106: 87-92. Hanson, H.C. 2006. The White-cheeked Geese: taxonomy, ecophysiographic relationships, biogeography and evolutionary considerations. Volume 1, Eastern taxa. AVVAR Books, California. Hanson, H.C. 2007. The White-cheeked Geese: taxonomy, ecophysiographic relationships, biogeography and evolutionary considerations. Volume 2, Western taxa, Biogeography and Evolutionary Considerations. AVVAR Books, California. Holt, C.A., Austin, G.E., Calbrade, N.A., Mellan, H.J., Hearn, R.D., Stroud, D.A., Wotton, S.R. & Musgrove, A.J. 2012. Waterbirds in the UK 2010/11: the Wetland Bird Survey. BTO/RSPB/JNCC, Thetford. Merne, O.J. 1970. The status of the Canada Goose in Ireland. Irish Bird Report 17: 12-17. Milne, P. & McAdams, D.G. 2009. Irish Rare Bird Report 2007. Irish Birds 8: 583-610. Mlodinow, S.G., Springer, P.F., Deuel, B., Semo, L.S., Leukering, T., Schonewald, T.D., Tweit, W. & Barry, J.H. 2008. Distribution and identification of Cackling Goose (Branta hutchinsii) subspecies North American Birds 62: 344-360. Ussher, R.J. & Warren, R. 1900. Birds of Ireland. London. Following this review 19 individuals have been added to Category A of the Irish List, along with the acceptance of the bird showing characteristics of hutchinsii at Kinnegar, County Down on 13th September 2007 (Irish Birds 8: 585). In addition, five more records from 2010 and 2011, which were not part of the review but were assessed in parallel, are listed here. A 1970 record currently constitutes the first accepted record of Cackling Goose in Ireland. Prior to this, a photograph of a party of Canada Geese present on the Slobs in 1969 included a bird that may well have been a Cackling Goose. There was, however, insufficient evidence to accept this record as the first for Ireland. 1970 Wexford One: One, subspecies unassigned but excluding B.h.minima, North Slob, 6th October to 28th April 1971, photographed (IBR 18: 27; 19: 32), paired with a Barnacle Goose and with four hybrid young (Picture 2). This currently represents the first Irish record. It was noted in the same report that most likely the same bird had been present in 1969, again paired with a Barnacle Goose, this time with two hybrid young. Unfortunately, there are no further details on file substantiating the 1969 record. 1972 Wexford Two: One, North Slob and South Slob, 18th October to 21st April 1973 and a second, 26th October to 21st April 1973 (IBR 20: 13; 21: 11), both subspecies unassigned but excluding B.h.minima. These were thought at the time to be a taverneri and a hutchinsii but the information available precludes identification to sub-specific level. 1973 Wexford Zero: One, North Slob, 14th October, and a second, 23rd October (IBR 21: 11; 22: 10), both remaining into spring 1974 and both presumed returning, subspecies unassigned but excluding B.h.minima. The information available precludes identification to sub-specific level. 1976 Wexford One: One, North Slob, 19th March (Irish Birds 1: 77), subspecies unassigned but excluding B.h.minima. 1978 Wexford One: One, North Slob, 26th October to 23rd April 1979 (Irish Birds 1: 423, 562), subspecies unassigned but excluding B.h.minima. 1996 Donegal One: One, Dunfanaghy, 27th February (Irish Birds 6: 68), subspecies unassigned but excluding B.h.minima. 1996 Wexford Two: Two, North Slob, 3rd November to 13th April 1997, photographed (Irish Birds 6: 68), subspecies unassigned but excluding B.h.minima. 2000 Sligo One: One, subspecies unassigned but excluding B.h.minima, Raghly Point, 6th January into February, photographed (P.Ellis). Considered by some to possibly relate to the subspecies B.h.taverneri or B.h.leucopareia. The committee are currently deferring assignment relating to B.h.taverneri in particular owing to the complexity around the identification and taxonomic status of this form and the likelihood of natural occurrence. 2001 Donegal Zero: One, subspecies unassigned but excluding B.h.minima, Dunfanaghy, 25th February to 10th March, photographed (C.Batty). Considered to have been the same bird recorded in 2000 at Raghley Point, Sligo, and seen subsequently in Scotland (C.Batty pers. comm.). 2003 Mayo One: One, Glosh, Mullet Peninsula, 29th September (Irish Birds 7: 551), subspecies unassigned but excluding B.h.minima. 2003 Sligo One: One, Raghley Point, 24th February to 7th March, photographed (Irish Birds 7: 551), showing characteristics of subspecies B.h.hutchinsii. 2004 Mayo One: One, Termoncarragh Lough, Mullet Peninsula, 18th to 23rd March, photographed (Irish Birds 8: 108), showing characteristics of subspecies B.h.hutchinsii. 2006 Clare One: One, Loop Head, 21st October, photographed (Irish Birds 8: 396), showing characteristics of subspecies B.h.hutchinsii. This bird was present with a flock of Barnacle Geese. A small 'white-cheeked' goose seen with the same number of Barnacle Geese on the Mullet Peninsula, Mayo the previous day was originally considered the same bird. However, on reviewing the report there was insufficient detail available to confirm the identity of the Mayo bird as a Cackling Goose. 2007 Down One: One, Kinnegar, 13th September (Irish Birds 8: 585), showing characteristics of subspecies B.h.hutchinsii. 2007 Mayo One: One, Annagh, Mullet Peninsula, 19th November to 25th March 2008 (D. Suddaby et al.) showing characteristics of subspecies B.h.hutchinsii. 2007 Sligo Two: One, Ballyconnell and Lissadell, 6th November to 12th April 2008, joined by a second bird, 15th November, photographed (D. Cotton, S. Feeney, S. Mugan et al. ), both showing characteristics of subspecies B.h.hutchinsii. 2008 Mayo One: One, Annagh, Mullet Peninsula, 25th March (D. Suddaby), in addition to one already at the same location, showing characteristics of subspecies B.h.hutchinsii. 2009 Sligo Two: Adult, Ballyconnell and Lissadell, 25th October to 8th April 2010, photographed (J. Geraty et al. ), showing characteristics of subspecies B.h.hutchinsii and accompanied by a Canada Goose B.canadensis (Picture 5); A different individual, Ballyconnell and Lissadell, 14th December to 8th April 2010, photographed (J.Foss et al. ), showing characteristics of subspecies B.h.hutchinsii. 2010 Sligo One: Adult, Ballyconnell and Raghly, 3rd November to 27th March 2011, photographed (D.Cotton et al. ), subspecies unassigned but excluding B.h.minima. This bird is believed by some to have been B.h.taverneri. However, the committee are currently deferring all claims relating to this subspecies owing to the complexity around the identification, taxonomic status and low likelihood of occurrence of this subspecies (Picture 6). 2011 Mayo One: Adult, Termoncarragh Lough, Mullet Peninsula, 1st to 4th November, and, presumed same, 7th to 19th December, photographed (T. Cooney et al. ), showing characteristics of subspecies B.h.hutchinsii. 2011 Sligo Three: Up to three, Lissadell, 1st November to 12th February 2012, photographed (M.Casey, D.Cotton, M.Enright, S.Feeney, S.McCanny et al.) (Picture 7), all showing characteristics of subspecies B.h.hutchinsii. The following records are considered acceptable as 'presumed to be of North American origin'. Unless otherwise stated, the records have not been assigned definitively to sub-specific level. 1969 Wexford Two: Two, North Slob, 27th October to 30th April 1970, photographed (IBR 17: 16; 18: 27). Four other individuals during the same winter are not assigned definitively to species. 1970 Wexford Two: At least four, North Slob, 24th October, one present until 26th April 1971, photographed (IBR 18: 27; 19: 32), two presumed returning. One, shot 18th January 1971 was examined and identified as canadensis (Picture 4), however with no further details available for assessment its taxonomic status cannot be confirmed beyond species level. Two of the remainder were smaller and considered at the time to be parvipes but this cannot be confirmed on the basis of the information available. Also present was Ireland's currently first accepted Cackling Goose (Picture 2). 1971 Wexford Zero: Two, North Slob, 30th October, joined by a third, 22nd November (the latter paired with a Greenland White-fronted Goose and with three hybrid young) (IBR 19: 32), all presumed returning. The mixed pair family were last seen 1st December with the rest remaining to April 27th 1972. A fourth, smaller bird, has not been assigned to species. 1972 Wexford Zero: One, North Slob, 19th October, followed by a second, 26th October, both remaining until spring 1973 with at least one remaining until 25th April 1973 (IBR 20: 13; 21: 11), both presumed returning. Also present were three smaller birds, two Cackling and one reported as a parvipes that cannot be assigned to one or other species. 1973 Wexford Zero: One, North Slob, 26th October, followed by a second on 2nd November and a third on 19th November, all remaining into 1974 (IBR 21: 11; 22: 10), all presumed returning. These were present with two Cackling Geese and one small bird, which cannot be assigned to species. The publication of this group as a group of seven in the 1974 Irish Bird Report (IBR 22: 10) seems to be erroneous as the files clearly indicate that only six individuals were involved. 1975 Wexford One: One, North Slob, 5th November to 11th April 1976 (IBR 23: 11; Irish Birds 1: 77). 1976 Wexford Three: One, North Slob, 11th October, joined by a second, 1st November, and a third, 10th November, all remaining to 30th April 1977 (Irish Birds 1: 253). The publication of this group as a group of four in the 1976 Irish Bird Report (Irish Birds 1: 253) seems to be erroneous as the files clearly indicate that only three individuals were involved. It is assumed that a number of the birds present during the 1970s were returning birds. With only one recorded in 1975 and no multiple records since 1973 these three are considered to be new birds. 1977 Wexford One: One, North Slob, 2nd November with four present on 7th November to 17th April 1978 (Irish Birds 1: 253, 423), three considered returning. 1978 Galway One: One, Creganna, 8th January to 28th March, presumed same Rahasane, 15th April (Irish Birds 1: 423). 1978 Wexford Zero: Three, North Slob, 23rd October to 23rd April 1979 (Irish Birds 1: 423, 562), presumed returning. A Cackling Goose was also present, and a fourth, smaller, bird that cannot be assigned to species. 1979 Wexford Zero: Two, North Slob, 8th November present into spring 1980 (Irish Birds 1: 562), all presumed returning. 1981 Wexford Two: Two, North Slob, from October to 4th March 1982 (Irish Birds 2: 205, 382). 1984 Wexford One: One, North Slob, late 1984 to mid-April (Irish Birds 3: 460). 1985 Wexford Zero: One, North Slob, 27th November to April 1986 (Irish Birds 3: 460), presumed returning. 1989 Mayo One: One, Cross Point and Termoncarragh Lake, Mullet Peninsula, 1st to 16th February (Irish Birds 4: 236). 1993 Wexford Two: Two B.c. interior, North Slob, 1st November until at least April 1994 (Irish Birds 5: 362, 452). One, trapped and ringed 1st November was subsequently shot, 14th January 1995, in Dorchester, Maryland, USA. This is the only totally confirmed transatlantic vagrant Canada or Cackling Goose. 1994 Louth One: One, Braganstown, 2nd January to 10th March (Irish Birds 5: 330). 1994 Westmeath One: One, Lough Iron, 1st November to 6th March 1995 (Irish Birds 5: 452). 1995 Kerry One: One, Cashen Estuary, 13th November to 6th February 1996 (M.O'Keeffe). 1998 Louth One: One, Lurgangreen, Louth, 31st October to 15th November, photographed (Irish Birds 6: 384). 2001 Wexford One: One, showing characteristics of B.c.interior, North Slob, 29th October to 10th March 2002, photographed (Irish Birds 7: 387). 2002 Mayo One: One, showing characteristics of subspecies B.c.interior, Termoncarragh Lough, Mullet Peninsula, 22nd January to 31st March, photographed (Irish Birds 7: 387). 2003 Derry One, showing characteristics of subspecies B.c.interior, Myroe Levels, 12th to 21st December (NIBR 16: 51, Irish Birds 8: 374). 2005 Kerry One: One, Lough Gill, 19th to 21st January, photographed (Irish Birds 8: 374). A rather small, dark individual, very similar to the 2002 Mayo bird considered to be B.c.interior but due to the quality of the images it was felt B.c.parvipes could not be ruled out. 2007 Wexford One: One, North Slob, 29th December to 3rd March 2008, photographed (T.Kilbane et al. ), showing characteristics of B.c.interior. 2008 Galway One: One, Slyne Head, 5th October, photographed (P.Moore et al.). 2008 Wexford One: One, North Slob, 22nd to 26th November (A.G.Kelly et al.). 2009 Sligo One: One, Ballyconnell and Lissadell, 25th October to 8th April 2010, photographed (J.Geraty et al. ), considered by many to be B.c.parvipes however the possibility of a small B.c.interior cannot be ruled out. 2009 Wexford Two: Two, North Slob, 6th February to 5th April, photographed (K.Grace, A.Walsh et al.). 2010 Donegal One: Adult, Malin Head, 2nd to 12th March, photographed (C.Mellon et al.). 2011 Donegal Zero: One, Malin Head, 23rd March to 3rd April (D.Hunter), presumed returning. 2011 Mayo One: One, Termoncarragh Lough, Mullet Peninsula, 7th to 19th December (D. Suddaby). This list consists of records where it is not considered possible to assign individual birds to one or other species. For completeness it also lists all the records post 1954 even though the records between 1954 and 1969 did not form part of the review due to the lack of documentation available. Some of these listed records were originally claimed as subspecies parvipes, the smallest subspecies of Canada Goose, however, the detail available during the review for many of the older records has not been sufficient to categorically assign them to a subspecies. The separation of parvipes from Cackling Goose requires close, careful observation and submissions for assessment by the IRBC should ideally be supported by good photographs and/or video footage. 1954 Down One: One, Downpatrick, 21st November (IBR 2: 11). 1955 Offaly One: One, shot, near Banagher, 31st October (IBR 3: 12). 1955 Wexford Two: Two, North Slob, 20th February (IBR 3: 11). 1957 Offaly One: One, Little Brosna, 16th March (IBR 5: 9). 1957 Wexford Four: Up to four, North Slob, 20th October to 2nd February 1958 (IBR 5: 9; 7: 8). 1958 Wexford Two: Up to two, North Slob and Killag, 24th November to 19th April 1959 (IBR 6: 9; 7: 8). 1960 Wexford Three: Three, North Slob, 22nd November to 3rd March 1961 (IBR 8: 9; 17: 16). 1961 Sligo One: One, Bunduff, mid-March to end April (IBR 9: 9). 1961 Wexford Five: Up to five, of which three 'small' wintered, 5th November to 19th January 1962, Wexford Slobs (IBR 9: 9, 10). 1962 Wexford Three: Up to eight, Wexford Slobs, 18th November to 23rd March 1963 (IBR 10: 10; 17: 16), presumed this includes five returning individuals. 1964 Longford One: One, Lough Kinale, 11th February (IBR 12: 16). 1964 Wexford Two: One 'Lesser', North Slob, 16th March (IBR 12: 16), presumed returning; Two "large", North Slob, 23rd March (IBR 12: 16). 1965 Wexford Two: Up to two 'small race', North Slob, 25th to 26th December (IBR 13: 22; 15: 24). 1966 Wexford Two: Up to two 'large race', North Slob, 2nd to 6th November (IBR 14: 26); One 'of smaller forms', North Slob, 25th December (IBR 15: 24), presumed returning. 1967 Wexford One: One, North Slob, 29th October (IBR 15: 24). 1968 Wexford Four: Two, North Slob, 23rd March (IBR 16: 23), one presumed same as October 1967; Up to five, with three wintering, North Slob, from 25th October (IBR 16: 23), two presumed returning. 1969 Wexford Zero: Four, North Slob, 27th October to 30th April 1970, photographed (IBR 17: 16; 18: 27), all presumed returning, with two large Canada Geese. Colour photographs available from the time strongly suggest the presence of at least one Cackling Goose. However, given that this would represent the first accepted record for this species in Ireland and that no other details are available to support the identification this record is currently deemed not proven. 1970 Sligo One: One, Lissadell, 30th March (IBR 17: 16). 1971 Wexford One: One, North Slob, 1st December 1971 (IBR 19: 32), considered at the time to be parvipes, with three large Canada Geese. 1972 Wexford Zero: One, North Slob, 31st October to probably 19th April 1973 (IBR 20: 13; 21: 11), presumed returning, considered at the time to be parvipes, with two Cackling Geese and two Canada Geese. 1973 Wexford Zero: One, North Slob, 19th November into 1974 (IBR 21: 11; 22: 10), presumed returning, considered at the time to be parvipes, with three Canada Geese and two Cackling Geese. The publication of this group as a group of seven in the 1974 Irish Bird Report (IBR 22: 10) seems to be erroneous as the files clearly indicate that only six individuals were involved. 1974 Wexford Two: Three, North Slob, October 20th, 23rd and 25th respectively, all remaining to 22nd April 1975 (IBR 22: 10; 23: 11). One was considered at the time to be parvipes and is presumed returning, while the other two were considered at the time to be hutchinsii. However, none are considered assignable to subspecies. Notably, the presence of a hybrid Canada/Cackling Goose x Barnacle Goose with one of the smaller birds raises the possibility this may have been Ireland's first Cackling Goose returning having first been recorded at this site in 1970 (Picture 2), though perhaps also present in 1969. 1978 Wexford One: One, North Slob, 26th October to the end of the year (Irish Birds 1: 562), with three large Canada Geese and a Cackling Goose. 1988 Wexford One: One, North Slob, from late 1988 to 15th March 1989 (Irish Birds 4: 85). 1989 Wexford Zero: One, North Slob, wintered 1989/1990 (Irish Birds 4: 432), presumed returning. 1990 Wexford Four: Up to five, North Slob, 11th November to 7th April 1991 (Irish Birds 4: 432, 579), one presumed returning. 1991 Dublin Two: Two, Lambay Island, 2nd February (Irish Birds 4: 579). 1992 Wexford One: One, North Slob, 30th October to 24th January 1993 (Irish Birds 5: 84). 1993 Louth One: One, Braganstown, 25th January to 21st March (Irish Birds 5: 214, 330). 1995 Kerry Two: Two, Lough Gill, 10th November to 6th December (Irish Birds 5: 452; 6: 68). 2000 Mayo One: One, Inishkea North, 8th March (Irish Birds 7: 87). 2006 Mayo One: One, Termoncarragh Lough, 20th October (Irish Birds 8: 396). 1985 Wicklow One, Broadlough, 3rd November. 1987 Derry One, Lough Foyle, 2nd November (NIBR 1986- 90: 26 & Irish Birds 3: 615), presumed feral. This was published in Irish Birds as 'possibly feral' but NIBR 1986-90 clearly states this to be presumed feral. 1990 Donegal One, Kiltooran Lake, 22nd January. 1990 Wicklow Six, Newcastle, 2nd January and three, Newcastle, 14th November. 1999 Cork One, The Lough, Cork City, 26th December to 8th March 2000, photographed (Irish Birds 6: 568) (Picture 8) This small individual is now considered to be a Canada Goose. 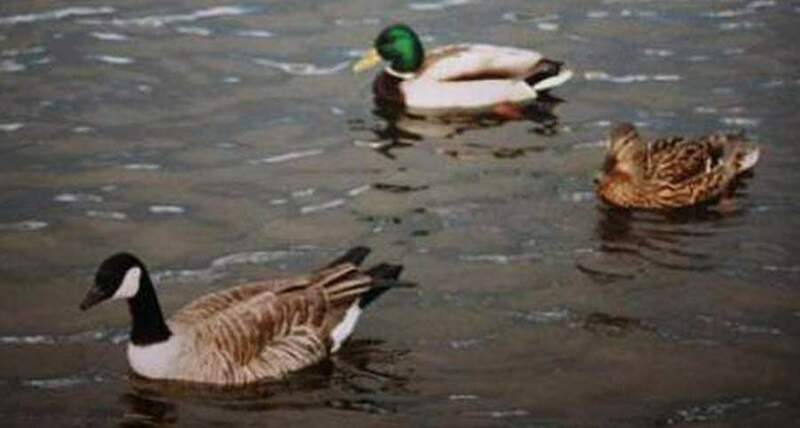 Given its location, tameness, damaged wing and association with a feral flock of Canada Geese it is not considered to have been of wild origin. The small size of this individual is puzzling and it may have been a 'runt' feral Canada Goose from the local population which, if it were the case, further compounds the identification challenges involving this species pair. 2006 Mayo One, Termoncarragh, Mullet Peninsula, 24th April to 4th May (Irish Birds 8: 396), is now considered to be of feral origin. 2009 Mayo One, Cross Lough, Mullet Peninsula, 30th May, photographed (D.Suddaby et al.). 2010 Waterford Adult, Ballyshunnock reservoir, 14th March, photographed (M.Cowming). Most of the records in this list relate to birds thought likely to be minima. Given that this subspecies is frequently kept in captivity in Europe, and its west coast distribution in North America, it is felt that records of definitive or likely minima may refer to birds of feral or captive origin. 1984 Dublin Two, Lambay Island, 4th February (Irish Birds 3: 297), considered to possibly refer to subspecies minima. 1985 Cork One, Lissagriffin, 31st March to 7th April (Irish Birds 3: 297 & 8: 585). The detailed description and sketches of this bird are suggestive of subspecies minima. It is interesting to note that two birds on Lambay Island, County Dublin shortly before the Cork occurrence may also have been minima. 1985 Dublin Two, Lambay Island, 12th January to 23rd March (Irish Birds 3: 297), considered to possibly refer to subspecies minima. 1986 Dublin Two, Lambay Island, 22nd February to 16th March (Irish Birds 3: 460), considered possibly of subspecies minima. 1987 Dublin Two, Lambay Island, from 21st November are part of an interesting sequence of records over a number of years from this location. From the various descriptions it was felt that subspecies minima could not be ruled out. In common with the record above, the location of these observations on the east coast of Ireland adds further weight to the possibility that this sequence of records may refer to birds of feral or captive origin. Interestingly a detailed comparison of the submissions for each of the four years involved in this sequence of observations suggests that there were in fact different birds involved on different years and not the same two individuals. 1996 Louth One, Lurgangreen, 9th January, photographed (Irish Birds 6: 68). This individual appears to be of the subspecies minima (Picture 3). If so, this would constitute the only confirmed record of minima for Ireland. Given the eastern location of this sighting in Ireland (perhaps further supporting European origin) the IRBC has taken the view that this bird was almost certainly of captive or feral origin. A PDF (size: 650KB) of the IRBC's Canada and Cackling Goose review as published in Irish Birds 9(4): 613-622 may be downloaded by clicking HERE.